At dental excellence we believe in maintaining a healthy beautiful white smile for life! The loyalty program has been developed to reward our clients who take pride in their smile and maintain regular hygiene appointments. In order to take part in the loyalty program you will first need to have a consultation with us to ensure you are suitable for teeth whitening. Once you have been approved, you will purchase a take-home teeth whitening procedure kit, including teeth whitening trays. You will also be responsible for keeping your hygiene appointments periodically as recommended. 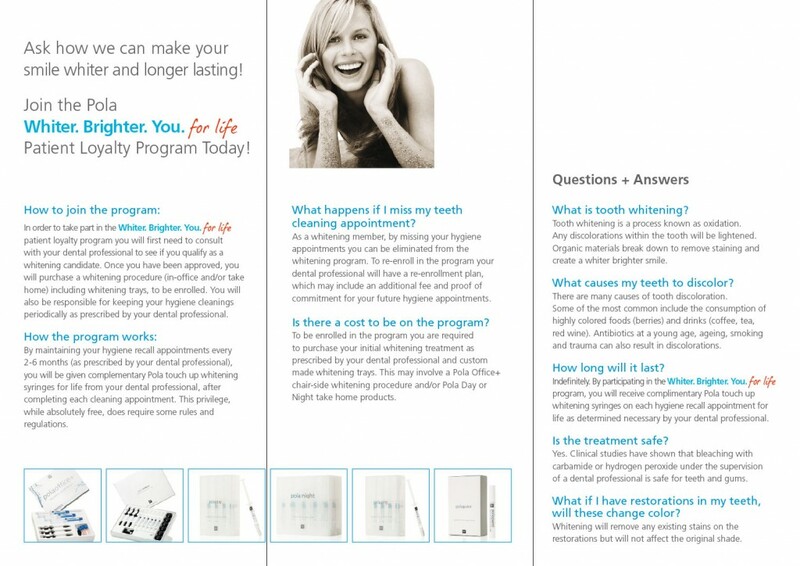 By maintaining your periodic hygiene (recall) appointments every 6 months with us, you will be given complimentary Pola touch up whitening syringes for life after completing each cleaning appointment. This loyalty program, while absolutely free, does have some conditions and restrictions. What happens if I miss my teeth cleaning appointment? As a whitening member, by missing your hygiene appointments, you may no longer be eligible to receive your complimentary teeth whitening products. To re-enrol in the program there may be an additional fee. Is there a cost to be on the program? To be enrolled in the program you are required to purchase your initial whitening treatment as recommended at your consultation plus home teeth whitening trays. This may involve In-Office and/or Pola Day or Night home whitening products.